Updated 04-02-14. Requests are closed for this post, but still have a Vietnamese word or phrase you'd like to hear? 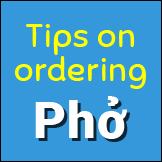 Here's what you do: go to Pronunciation of Pho and Other Vietnamese Words and Phrases, Part 2 and make a request there with the word(s) you would like to hear pronounced, and I'll be happy to post audio files for those. Pronunciation of the surname Nguyen (Nguyễn) can be found in #50 below. Now, on with pronouncing Vietnamese words and phrases. A single sound can sometime confuse you even more than no sound at all. Therefore, I'll also provide full sentences to demonstrate how the words/phrases should really sound in everyday conversation. You should be able to recognize these sounds in both English and Vietnamese conversational sentences. Here are some useful Vietnamese phrases in no particular order. "This bowl of pho bac is quite big." "I eat pho bac every chance I get." "Pho chay has no meat ingredients." "I had some pho chay just last week." "My friend Tim eats pho ga and nothing else." "Pho ga is my sister's favorite noodle dish." "My friend Mason orders pho tai every time." "Pho tai is very easy to enjoy." "I'll have some hu tieu when pho is not available." "Hu tieu uses the same noodle as pho." "Tan Son Nhut," Southern Viet accent. "Tan Son Nhat," Northern Viet accent. Southern Viet accent, slow then faster. Northern Viet accent, slow then faster. Southern Viet accent, cà phê sữa đá. Northern Viet accent, cà phê sữa đá. Southern Viet accent, cà phê sữa nóng. Northern Viet accent, cà phê sữa nóng. Pronounce: Xin chúc mừng cho 50 năm hôn nhân và gia đình tuyệt vời (Happy 50th wedding anniversary and a splendid/magnificent family.) See comment #18 below. Pronounce: Xin chúc mừng 50 năm hôn nhân và dồi dào sức khỏe, thọ lâu muôn tuổi (Happy 50th wedding anniversary, with great health and longevity.) See comment #18 below. Pronounce: Chúc mừng sinh nhật (Happy Birthday.) See comments #20 and #21 below. Pronounce: Bún Bò Huế (Hue-style spicy beef noodle). Southern then northern accent. Bún Bò Huế (Hue-style spicy beef noodle). Southern then northern accent. Pronounce: Hủ Tiếu Nam Vang (hu tieu Phnom Penh-style noodle). Southern then northern accent. Hủ Tiếu Nam Vang (hu tieu Phnom Penh-style noodle). Pronounce: Bún Mắm (fermented fish soup noodle). Southern then northern accent. Bún Mắm (fermented fish soup noodle). Southern then northern accent. Pronounce: Mì Quảng. Southern then northern accent. Mì Quảng. Southern then northern accent. Pronounce: Việt Nam. Southern then northern accent. Việt Nam. Southern then northern accent. Pronounce: Xin Chúa nhận lỗi chúng con (Lord forgive our sins.) Southern then northern accent. Pronounce: Chúc Mừng Năm Mới (Happy New Year.) Southern and northern accent are similar. Pronounce: Bà Nội (Grandmother - maternalpaternal) and Ông Nội (Grandfather - paternal.) Southern and northern accent are similar. Pronounce: Gỏi cuốn (Spring roll.) Southern then northern accents. Pronounce: Đặng Thùy Trâm. Southern and northern accent are similar. Translate and pronounce: “Hey, just hold on there a minute!” This can be translated to several different ways in Vietnamese, depending on the context, personality and region of the speaker. Several variations are provided, but not by any means exhaustive, and each is just as valid and applicable as the other. Only southern accent is provided. First all 4 variations in written form, then audio of all 4 together. 1. "Khoan, chờ một chút, từ từ đã!" "Wait, just a moment, slow down!" 2. "Từ từ, chờ chút!" "Slow down, just a moment!" 3. "Khoan, chờ một chút!" "Wait, just a moment!" 4. "Khoan, từ từ đã, chờ một chút!" "Wait, slow down, just a moment!" Pronounce: Xinh. Southern then northern accent. Southern and northern accents similar. Slower then faster speech. Chúc bạn được một niềm vui và tình yêu thương. Southern accent. Slower then faster speech. Southern/northern accents similar. Slower then faster speech. Southern accent slower then faster speech. Same for Northern accent. Xin vui lòng yên lặng. Đức Huy Trần or Trần Huy Đức. Phi công - Southern and Northern accent similar, repeated twice. Đại uý - Southern and Northern accent similar, slow then normal speech. Pronounce: Hello, goodbye, please and thank you. Chào - chào anh - chào chị. Southern accent, slow then normal speech. Phở áp chảo bò gà tôm. Southern accent twice, then Northern twice. Pronounce: Ordering extra bánh phở noodles with your phở in Vietnamese. 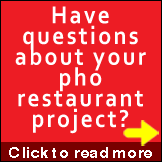 See "How to Order Extra Bánh Phở Noodles With Your Pho". Here's a look at what bánh da lợn looks like for those not familiar. Pronounce: Various types of Vietnamese bánh mì in Vietnamese. See " How to Say Bánh Mì (Banh Mi) Vietnamese Submarine Sandwich ". Pronounce names of boys in orphanage requested by Kay Coombes: Trí Đức, Phước, Lương, Phong, Bình/Bính, Thanh/Thành, Thiên/Thiện, Toi (unknown/not pronounced,) Vũ, Sang, Tâm, Tân, Sơn, Nhật, Tùng, Tuấn. Pronounce the female name Anh-Thư. Pronounce words and names from the play "Minefields and Miniskirts" as requested by Melissa. All pronunciation in Southern accent. Pronounce the female name Ngọc-Hân. I just want to close this post with this photo to the right. While it seems just a funny and odd sort of thing, it says so much about us Vietnamese that I can't help but chuckle every time I look at it again. It's really not about the fact that there are customers who want to taste the jackfruit so badly before they decide to buy it, that they will go get a knife from the store shelf in another store section to cut it up and try it; I'm sure this can happen in any retail shop anywhere. 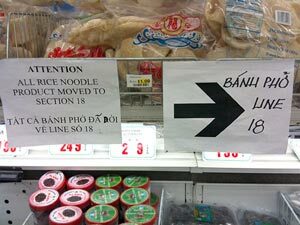 It's really about how the supermarket treats its customers, in a tactful and very Vietnamese way. I see a lot of love for fellow countrymen, with lots of understanding about the fact that we love our fruits so much we'd go to such length to make sure we buy only great tasting jackfruit; by trying it out first. So with this understanding and love, the store just gently requests that the customers stop doing it. Priceless. Comments are always welcome in the comments below. For new requests, please go to the new post Pronunciation of Pho and Other Vietnamese Words and Phrases, Part 2 and leave your request there. Thanks for visiting. @Reg Nesbitt. Thanks for dropping by and leaving a request. Please see number 8 above, and have fun ordering your next bun thit nuong cha gio! @Gina. Thanks for your request. Since some of these words have different meanings depending on the context and each word can have 3-6 varieties of writing and pronouncing (with correct vowels and tone marks), can you provide maybe a sentence from the book? If you can provide some sentences in context, I’d be glad to provide pronunciation for them. No additional info is needed for #5. I can now order my favorite dish properly – Bún thịt nướng chả giò – at Pho 777 in Chicago. Thank you for your work here, I love your website. @Felicity. Thanks for the kind words. Which context works for you in the following? “sua chua” or sữa chua means sour milk or yogurt. This one may have multiple meanings with proper accent marks. Can you give me some context? They’re up as numbers 9, 10, and 11. Thanks for visiting. Enjoy. hehehe. Both! I spent several years working at the corner of Argyle & Broadway in Chicago and got to know many of the restaurants & owners. Not many Italian gals would wander in their shops alone for lunch. That was the late 80’s! I missed the food most of all when I left that job. So this summer I vowed to go back & rediscover my favorite dishes, and luckily my hubby is game. Been way too long. Cafe sua da leaves Starbucks in the dust. Thanks again for your help. @Carmie You’re very welcome. You worked at Vietnamese restaurants for 2 years? As I understand it that area is full of ethnic shops and activities. How cool is that? And yeah the Starbucks stuff is too watered down and over priced. hi i was wondering what a girlfriend calls her boyfriend and vice versa to my knowledge its am or em and an or on. Is this correct and if not please educateme. amy: In Vietnamese, a husband/wife or BF/GF relationships are similar. The male always takes the “older brother” role regardless of age, and is addressed as “anh” by the female companion. The female takes the “little sister” role as “em” – pronounced just like the letter “m” – as addressed by her companion. Hope that helps. how do I say: xin chúc mừng cho 50 năm hôn nhân và gia đình tuyệt vời. Thanks for your request. Please see #13 above for the audio. While what you’re requesting is technically correct (the words “xin chúc mừng cho 50 năm hôn nhân và gia đình tuyệt vời” in effect mean “Happy 50th wedding anniversary and a splendid/magnificent (or various other synonyms) family,” the words “gia đình tuyệt vời” may be more suitable for a younger couple. Therefore you may not want to use it for people past their 60’s and 70’s, which is what the 50th anniversary implies. You may want to try this: “Xin chúc mừng 50 năm hôn nhân và dồi dào sức khỏe, thọ lâu muôn tuổi,” which is #14. Can you please translate the Happy Birthday song in vietnamese? Thanks for the request. This is a tough one. Let me try and help this way. But translating for singing? That’s another matter. When Happy Birthday is sung in Vietnamese (and I’m sure as in many other languages,) it no longer retains the exact words and meaning because it just doesn’t sound right. Most Vietnamese, including those in Vietnam, sing the song in English. People get creative and use similar meanings for singing, as long as it conveys the idea that you are wishing someone a happy birthday. I’m neither a singer nor a songwriter so will have to borrow someone else’s work here. 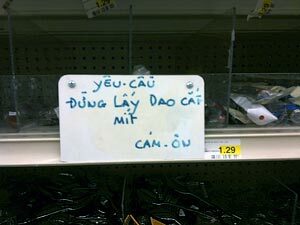 Below is one way to do it in Vietnamese. Enjoy. One way to sing Chúc mừng sinh nhật. I’m so glad I found your site, it’s been extremely helpful so far. Could you tell me how to pronounce mi quang? The q has me confused, as I haven’t run across it anywhere else. Hi Vicki. The pronunciation for mì quảng is number 19 above. I think one reason for your confusion is the following: southern pronunciation of “quang” sounds like “wang,” while northern pronunciation sounds like “quang” with the “qu” pronouncing like those in the English word “quit.” Enjoy your mì quảng. I was wondering if you could translate a phrase from the Movie Hamburger Hill ? I have been searching and can not find the meaning of the words. It is in this youtube clip. they say something like. . .
One movie off the top of my head, Mel Gibson’s We Were Soldiers, did use Viet actors and dialogues for many speaking VC characters, but the problem is the dialogues sounded more like speeches in the class room (too formal) and not appropriate for military/battlefield situations. That VC Commander would not have talked the way he did to his troops during those scenes inside the tunnels. So there you have it: the challenge of getting it right. 2) They did have a Viet language adviser but the actors just couldn’t get it right in the time that they had shooting the scene. What’s the correct pronunciation of the name of the country, Vietnam, and are there different pronunciations depending on the region? Thanks for your explanation, Cuong Huynh. I’m glad to know all that, but actually the uncertainty that prompted my original question was about the pronunciation of Nam, and I failed to mention that because I thought you’d be sending me a sound clip. So, does Nam in Viet Nam rhyme with the American pronunciation of the name Tom or with the name Sam? Hope to hear from you on this. Dave Brast: I understand your question now. The pronunciation is number 20 above. Nam should be pronounced as in “Notre Dame” with the French accent, no matter what regions of the country. The “Sam” sound, in my opinion, is a derogative use of the word, born out possibly from the Southern U.S. accents. Its use is much like “Jap” for “Japanese” from WWII, in my opinion. It had its time. Thank you so much for your reply. What you answered was what I had heard from other sources, but coming from a native speaker, your statement is definitive. By the way, I too had guessed as you did as to the origin of the”Sam” sound. Dave Brast: Thanks for your interesting question. You’re one of the few who noticed this differing pronunciation of Nam. I cringe when I hear someone say it the wrong way for many reasons, one of which is “Nem,” which is a Vietnamese fermented pork roll. Ouch! So this gave us a chance to discuss, explain and set it right. You rock! I recalled that Lyndon Johnson pronounced Viet Nam to rhyme with Sam, so I did some searching with YouTube and found a speech of his in which he says it just that way: http://www.youtube.com/watch?v=wAQPh5zYFUs&feature=PlayList&p=0A9C4120DB772CD9&playnext=1&playnext_from=PL&index=8. Given that he caused so much death and destruction in Viet Nam, I can see why you might cringe. In the same vein as your remark about Nem, I had guessed that even the correct pronunciation of Nam, if it were part of Viet Nam but without the correct accents and tonal values, might mean something entirely different. Is that true, and if so what are some other meanings Viet Nam can have depending on tonal values and accents? Dave Brast: I wouldn’t say LBJ caused “so much death and destruction,” at least not in the way you wrote, and certainly I cringe not because of LBJ, but again because of the pronunciation of the word Nam itself by anyone. The words Viet Nam are two of the easiest to pronounce in our language, and except for those I described already, there is no other regional variations. Viet means the Viet people, and Nam means South, in relation to Trung Hoa, the center that is China. I don’t think there are any other significant accents or tonal values, or meanings for these 2 words. which is really one word when written in Vietnamese as Việt-Nam. Dave Brast: thanks for stopping by. Come back soon. Hi, can you please tell me how to say: Xin Chua nham loi chung con. I am the music director at a church and we are singing several phrases in various languages. I believe this translates roughly as Lord hear our prayer. Chris: Thanks for your request. Please see number 21 above. I think the actual phrase should be “Xin Chúa nhận lỗi chúng con” with an n in nhan, and not an m. Anyway “Xin Chua” means “Dear Lord,” “nhận lỗi” means essentially “accept sins or faults,” and “chung con” means “us or our.” So I would translate it to Lord forgive our sins or Lord accept our sins. Thanks for your response. That will really help us say it correctly! I appreciate the translation too. Chris: Thanks for stopping by. It’s my pleasure to help out. Kalena: Thanks for dropping by with a request. You can pronounce Chúc Mừng Năm Mới or Happy New Year in Vietnamese as noted in number 22. above. Have fun and definitely Chúc Mừng Năm Mới to you too! Xin Chúa nhâm lòi chúng con. Since this is sung to different tunes, I would love to hear a spoken recording that would help me be more confident of the phonemes. Eldo Bergman: Thanks for your request. It’s actually been asked by Chris and answered (see a few comments up above) and the pronunciation is number 21 in the post. Maybe you and Chris should hook up. Good morning! Can you please tell me how to pronounce “ba noi” and “ong noi” (grandma & grandpa)? My son is starting to talk, so it’d be nice if I knew how to say them properly in front of my in-laws. Thanks so much! Could you please pronounce “spring roll” — gỏi cuốn? Jennifer Lee: Thanks for your request. Enjoy some goi cuon for me too. Goi cuon pronunciation is as shown in number 24 above. Linda: Hi, I think her full name is Đặng Thùy Trâm, and the pronunciation is as shown in number 25 above. ron: I’m not familiar with websites teaching Vietnamese, so can’t recommend one for you. I can offer the following though. If you mean to meet Vietnamese women in the U.S. then I’m sure they at least speak some English, if not already fluent. Of course there are always some who don’t speak English, but regardless of whether you mean Vietnamese women in Vietnam or overseas, one thing is for sure: just be yourself, be sincere, behave gentlemanly, and show that you understand her culture, and assuming you do all that in honesty, you won’t have problem attracting Vietnamese women. Sorry I can’t help you much more than this. The context is the other character wants to do something to the character I play, my character wants him to stop, and says that phrase in several different languages. Can you please pronounce this song. Caroline: Thank you for your request about pork pho. Unfortunately, pork pho doesn’t really exist in Vietnam or to a Vietnamese, at least as far as I know. The closest I can think of what you want is hu tieu but I don’t think that’s what you meant. 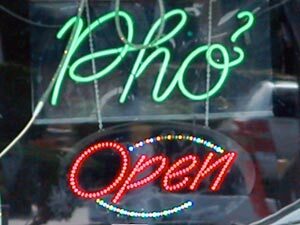 If one translates it to Vietnamese, pork pho would be “pho heo” and though it’s not hard to pronounce, it would sound quite strange and funny because pho heo doesn’t exist. My theory is, pork pho recipe and their availability at your local restaurants are concoction by restaurateurs and chefs to attract new, non-Viet clientele. They’re not what a Viet would expect to exist and order. I’m the person who asked about the phrase “Hey, just hold on there a minute” for use in a play. How come you have not answered? Hi Miriam: My response to your request will be up in a few minutes. Hi Miriam: Please see audio number 26 above. It’s not a simple translation, but I give you some options so you can pick whatever works for you. Good luck and thanks for the request! It was fun. Wish I can see you in action on stage. This is so terrific! Thank you! We adopted our oldest son from Vietnam (Vung Tau) and have heard so many different ways to pronounce his given name (now his middle name) that I hesitate to try anymore. His middle name is Xinh. Any help? Thanks! Hi Robyn: I’m sure your adopted son has a good home. The name Xinh should be quite easy to pronounce, though I’m not sure if there are any accent marks associated with this uncommon name. The pronunciation number 27 above assumes no accent mark on the name. Hope this helps. Thank you so much! There are no accents marks on his name. We’ve always pronounced it with the southern accent since he’s from the south and will continue to do so. Again, thank you so much! Hello! Could you please tell me how to pronounce the name of the dish ca kho to (claypot fish)? Can you tell me how to pronounce the province of “Hua Nghia” in So. Vietnam.? I served there in 1968 as a medic w/ the 25th Inf. Division. Hi Mira: Cá kho tộ is pronounced as in number 28. Thanks for leaving a request, and enjoy one for me. It’s one of my wife’s fav! Hi Sue: your request can go many different ways due to the fact that the English words “i” and “you” can have many meaning in Vietnamese, depending who speaking and whom is spoken to (male, female, older, younger, family, friends, etc.) I took the friendly courteous, civil and polite route between two associates. Please see number 29. Of course this will not sound right if you give this wish to a much older or younger individual. Hope this helps. Hi tom mcdugald: Please see number 30 for the pronunciation of Hữu Nghĩa which I think is more correct than what you have. I salute your service. I am trying to figure out how to say “Quiet Please” in Vietnamese. Can you help me with this? Ideally I would love and audio link so I can hear how to pronounce it correctly. Hi Christine: Ông ngoại, bà ngoại (grandpa, grandma) can be heard with the audio #31 above. Thanks for your request! Hi Timothy Brennan: “Quiet Please” in Vietnamese has many variations depending on situation (formal, non-formal, friends, etc.) I chose the formal way as demonstrated in #32. Thanks so much for requesting. How do you pronounce the name “Duc Huy Tran”? Hi Dave: You may know this already, but for others who don’t, for Viet names, it’s customary for the surname Tran to go first and the given name Đức goes last. Check out #33 for pronunciation of Đức Huy Trần and Trần Huy Đức. Thanks for stopping by. Hi: I’m looking for the words for “hello,” “goodbye,” “please” and “thank you.” I’m too old and too lazy to see if these translations are already on your website. Sorry. I am reading a diary of a soldier during the viet nam war. He was called by the Vietnamese On Toy Phi Cone. I want to know how that is pronounced. Also her refers to the Dai-uy, the chief, of a village. How is that pronounced? I second the request for banh mi. Also how do you say “banh da lon”, the green and yellow striped dessert? Thanks. Richard, Christian, and Jim Fung: Thanks so much for your request. I will need a few more days to get the recordings posted per your request on both the greetings/salutation and banh mi, so please bear with me. The banh mi request will probably deserve its own post and I’ll have that up within the week. So while you wait, why not go for some banh mi. Hi Richard Friedenberg: I do not recognize On Toy Phi Cone as Vietnamese, but would venture to say it is a non-Viet’s interpretation of Vietnamese. I would guess Phi Cone is actually Phi Cong which means pilot, one who flies an airplane. Dai-uy is the Army rank of Captain, so that is straightforward. These are pronounced as indicated in #34 above. If you can clarify or provide more info on On Toy Phi Cone then I can do a pronunciation for you. Have a great day! Hi Richard: Please see pronunciation #35 for “hello,” “goodbye,” “please” and “thank you.” Please note that the first three have a number of translational variations, and I only included the most common translations. You may run across different usage for hello, goodbye and please. Enjoy. Love your Web site. Would you please demonstrate how to say cheers in Vietnamese with a southern accent? I believe the word is Chia. Hi Melissa: You did not mention where you have heard this but I believe what you heard as something like “chia” was actually a Vietnamese way of saying “cheers” itself. We Vietnamese have a tendency to adopt English (or French) words into Vietnamese use without translating them. Other examples that come to mind include “nhà băng” for the bank, “xe Xích lô” for the cyclo, etc. wow! this is great! Do you mind if I put some of these on flashcards for your readers? I think Quizlet supports audio. I’ll send you a link. Hello PHO AP CHAO BO GA TOM: Please see #36 for pronunciation of Phở áp chảo bò gà tôm (Pan fried flat rice noodle with beef, chicken, shrimp.) Thank for requesting. I appreciate the site very much. I work around an area with at least a dozen vietnamese restaurants but never felt comfortable going inside without having a clue what was on the menus. After going through the site I can now read and understand most of what they offer. Could you pronounce “chanh muoi”, the lemonade drink (sorry if I misspelled)? Could you post a few other beverages as well like bubble tea etc? Thanks!! Hi John: Thanks for your request. I’m sure you now are a lot more confident hitting a pho place knowing exactly what’s going on! More power to ya. Chanh muối and the other salted preserved citrus soda varieties are my summer favorites! Refer to #37, 38 and 39 above for chanh muối/soda chanh muối (salted preserved lemonade in soda,) soda chanh (fresh lemonade in soda) and sữa đậu nành (fresh soybean milk,) respectively. I’ll have to defer boba tea and the other drinks for the next round of recordings. Hi Courtney: I’m glad you made a new friend from Vietnam. Based on my own personal experience, when all else fails, there are three things we can always count on to help or befriend someone with a different culture and language. They are in no particular order: a good dictionary, good hand language and gesture, and a lot of patience and desire to learn from each other. You didn’t say where you are from originally and where you live now, but I would guess that if the person is an exchange student, then he/she has a goal of learning about the American way and of course, English. So I’d say speak and teach English slowly but firmly and constantly, that is the best way. It’s like going to Shanghai and not learning any Chinese. Sort of defeat the purpose of being there, wouldn’t you agree? Hi Courtney: Thank you for your inquiry. I misunderstood your original question to be how you could help your friend to be better with English. But it turns out you were asking about how you could learn Vietnamese! Wow I was way off I guess. 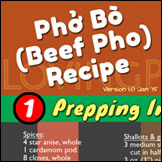 OK, while this lovingpho.com website aims to help readers with some Viet pronunciation, most specifically related to pho, I did not expect to be teaching Vietnamese to non-Viet speaking readers! How funny is that? Any way, I would suggest you use you favorite search engine the find online sources like this one: learn Vietnamese search on Google, or even the YouTube channel like this one: learn Vietnamese on YouTube. Hi Courtney: Another idea for you. If you already read and write in Vietnamese, then I know you can listen and understand much of it too. There’s no better way to learn than to listen, and there are plenty you can listen to online nowadays. I’d recommend the following sources including their video/audio programs and podcasts: Radio Free Asia – Vietnamese (RFA) and VOA in Vietnamese. Have fun. Thank you so much for doing this! I am wondering how you pronounce “Phu Long?” It’s a town up north on Cat Ba island. I’m doing a family history and my friend’s grandmother says she is from Po Wan (that’s how I hear it) and Cac Ba and that by boat it took about 6 hours to get to Hai Phong. So I’ve been looking at maps and trying to figure out where this could be. Phu Long on Cat Ba island is my best guess! Any chance Phu Long sounds like Po Wan? Thanks! Hi Sandy: “Phu Long” certainly does not pronounce or sound like Po Wan, but Phù Long near Cát Bà Island is certainly a good candidate for what you’re thinking of. Phù Long is pronounced as in #40 above. In my opinion it’s very hard to mispronounce the L in Long to sound like a W in Wan. Any way, I also included Phú Long which is a name of several other places in South VN just so you hear the difference. That’s all I can contribute for now. Hope you find what you’re looking for, and if you do, please share with us! Good luck. Hi! first thanks a ton for this website, this is great! I have to give a talk next week, touching the Sino-French war in 1884/5, and thus I need to know how to pronounce the name of the northern Vietnamese city of Bắc Ninh, where a battle took place…. Hi Ulrike: Thanks for your request on Bắc Ninh. Please see #41 for its pronunciation. It’s an interesting topic, so please feel free to come back and share with us your presentation via a link or however you see fit. có thể tôi xin có bún thêm cho một đồng đô la phụ? Tôi rất đói. can i please have extra rice noodles for an extra dollar? i’m very hungry. Me again! I was wondering if you had the chance to do the recordings for the greetings/salutation and especially for the different “Bánh mì”’s (Bánh mì gà, bánh mì trứng, bánh mì bì, bánh mì thịt nướng, bánh mì xíu mại, bánh mì thịt nguoi). The Google translation gives you ok translation but not grammatically correct conversational phrases, so I took the liberty to improve while simplifying it at the same time. Hope this helps. Enjoy and thanks for the request. Hi Jim Fung: Wow I can’t believe I forgot about your request! My apology. The pronunciation for “bánh da lợn,” which really means pork/hog skin pastry/cake, is #43. This is because it does look like the part of a pig that’s known as bacon. Bánh is cake/pastry, da is skin, and lợn is the Northern Vietnamese word for “heo” or pig/pork. I do like this green and yellow striped sweet treat as well. Here’s a look at what bánh da lợn looks like for those not familiar. It is soft and sweet, chewy and most definitely yummy! Hi Christian Belanger and Jim Fung: It’s a long time coming but your request on how to say various types of bánh mì can be heard from the audio files in this post: “How to Say Bánh Mì (Banh Mi) Vietnamese Submarine Sandwich.” Thanks for the request! Hi Janet: The word “Nam” as you have spelled (no accent marks) means “south” in Vietnamese and has the same pronunciation with any accent (in Bac, Nam, Trung or Northern, Southern, Central accents.) It should be pronounced like “om” in “mommy” and not like “am” in the words “stamp” or “I am.” With other accent marks; as in năm, nấm, or nạm; it would have different meanings and pronunciation. Hope this helps. thank you for your informative articles on Pho. I am making a documentary on Pho and would love to have an interview with you. Please let me know if this is something you’ll be interested. Dear Hanh: Moving to private communication. It’s good that you mentioned they are all boys, so that can help. Yes they are all boys names, and would be very appreciative if I could have the correct pronunciation. Hi Kay Coombes: I’ll gladly do these pronunciation for you. I’m on travel right now and will get to them by next Wed sometime. Hope this is fine for you. Hi Kay Coombes: Here you go, check out #46 for pronunciation of your names. The name Toi is unknown to me so I left it out. With accent marks I can do it but can’t say it without the marks. For those names that can have more than one way to pronounce, I use a slash (/) to separate them and pronounce both for you. Also I think “Son Nhat” should be 2 separate names so I pronounced them separately. Otherwise Tan Son Nhat is of course the name of the airport, which is pronounced as in #6. Hope this helps, and thanks for your request. Hi Krookface: Assuming you meant the female name Anh-Thư, it is pronounced as indicated in audio #47 above. And if you meant the actress/model Anh-Thư, here are some Anh-Thư photos for those not familiar. I am helping produce a play called Minefields and Miniskirts – it’s the untold stories of 5 Australian women who were involved in the Vietnam War … we have several words that we want to get phonetically correct – I think they are all town/place names. Would you be able to help me with these?? We want to make sure our fantastic actors nail the words and do credit to the women whos stories are being told. There are 13 in total. Melissa: I’d be glad to help. Please just provide the words in the comments here and I’ll do my best. If you can provide the context in which they are used then that would ensure I do it correctly. Knowing that they may be towns/places is very helpful. Do you have a website or reference where we can read about your play? Oh thank you thank you thank you …. I’ll post this as a 2 part comment. Part 1 giving you an idea of the play and the 2nd post will be the place names … I’ll include the sentence they are all in to see if that helps. But it’s based on a book written by Siobhan McHugh of the same title. The book tells the stories of about 100 women involved in the Vietnam War. The play takes all of the stories and turns them into 5 women and uses parts of everyone’s story to give the characters life. There is a character called Ruth who is in Vietnam as a reporter. She tells of coverups by the government – including the torture of Vietnamese girls and the peril of falling in love with a soldier who dies in the war. She returns to Australia a different person …. Then there is Sandy who goes to Vietnam as a dancer to entertain the troops. She witnesses more bloodshed than she could have ever imagined only to return home to find that the money she had made during her years in Vietnam had been stolen by her Manager. Kathy is a nurse who is in Vietnam for most of the war. As a nurse she sees some awful things and becomes quote close to a number of soldiers who never return home to their families. And then there is Eve who goes to Vietnam as a church volunteer helping in Vietnamese orphanages. She has a soldier die in her arms the day before he returns home and witnesses the outrages things that happened to some of the children involved in the war. It is such a touching story which needs to be told, we remember that soldiers fought in this awful war – but then there are thousands of other people who were there, and may not have held a gun, but their lives were changed forever. xanh: the basic word for blue and green is the same, xanh, but it’s the xanh of the sky or the xanh of the trees. That’s all I have at this stage. Thank you so much for offering to help. … I can not for the life of me find anything to help with pronuncing words. Feel free to email me if you don’t want to clog up your message board with this. Melissa _newton@hotmail.com …. Thanks so so so so much!! Hi Cuong – thanks for saying that you would help but just wondering what was going on because that was weeks ago. I was wondering if you were indeed able to be of assistance or do I need to keep looking for help??? Hi Melissa: I’ve been on travel but will have this on later today. Thanks for your patience. Hi Melissa: I’ve recorded the pronunciation for your request in #48 above. I also made some corrections for a few that I thought more appropriate for your situation. Examples include: Đồng Khởi instead of Dong Koi, Ban Mê Thuột instead of Ban Me Thout, An Khê instead of An Kae. The last one, Phuong, may not be a place name because with rare exception like Hue, Vietnamese place name do not normally have just one syllable. Therefore I did a pronunciation for Phương which is a female name. Phượng is also a female name and a flower as well. You may also refer to #7 and #16 for usage of the city name Huế. Hope this helps you. Good luck with the play. Thank you so so so so so much for all of your help 🙂 I really really appreciate it. I hope you had an incredible time on your travels!! Hi Melissa: I’m glad that helped. Hi Peter: The female name Ngọc-Hân is pronounced as in #49 above. All Vietnamese names have hyphens (-) especially two-syllable female names. The tricky pronunciation for Vietnamese language is definitely the “ng” part. Hi Peter: Bún Bò Huế is pronounced as demonstrated in #16 above. I will get the pronunciation for Nguyễn soon for you. Thanks for requesting. Hi Peter Calcott: The last name Nguyễn is pronounced as provided in #50 above. The “Ng” is the challenge for most Westerners, and many Vietnamese have settled on “win” when they teach their American friends how to pronounce it. But this really does not do the name justice. For those wanting further understanding of the word I suggest the discussion on Wikipedia on Nguyễn. Hope this helps. Cuong! Great work!! Cảm ơn bạn đã dạy chúng tôi! Hi Mike Minh Owens: So your name is Mike but you have a Viet name of Minh? That’s real cool! Did your wife give you that name? And did you know that Minh means smart or intelligence? Yes I would agree that there’s no better way to learn a new language than being in the environment. You’ll be forced to learn quick, and you will do it quickly too. Look at many of us Vietnamese having to make it in North America, Europe and Australia 😉 Anyway, I’m glad you found LovingPho.com helpful. Six months in Vietnam during winter months will beat any Toronto winter! Ya! You gotta go buddy. PS: Your Vietnamese is commendable! Though I couldn’t figure out what “the ban ngo!” might mean… Would you care to elaborate? Hi Luis: Can you provide the context in which your request of “Người Rừng” is used? Under what situation are these words utilized? This way I can determine the best way to help you. Thanks for your request. So “Người Rừng” really means “jungle people” as “nguoi” can be either male or female. Thanks for your request Louis. We have a friend, Kim, whose “real” name we have learned is Nguyet. Could you pronounce it for us, please. I am reading in a play and have a simple phrase which I believe has been written in Vietnamese. Appreciate any help in having it said as correctly as possible. Toi nau an cho gia dinh toi. Hi Reece Little: The name Nguyệt is pronounced in #2 of the post Pronunciation of Pho and Other Vietnamese Words and Phrases, Part 2. Hi Harry: Interesting phrase, whatever play you are reading. “Tôi nấu ăn cho gia đình tôi” means “I cook for my family,” but in conversational speech, it may be said in several different ways. You can hear the audio in #3 of this article Pronunciation of Pho and Other Vietnamese Words and Phrases, Part 2. Good luck with the play! Hi Kate: There are 2 issues to your request that I want to understand before recording the audios. You did not say how old the child is or whether or not he/she is fluent in Vietnamese. For a child in kindergarten who may be struggling with learning both Vietnamese and English at home, I am not sure if speaking to him/her in heavy accented Vietnamese is a good idea; I assume you will try to speak Vietnamese in heavy English accent. Your request does not have simple answers, so please read on. The word “good” has multiple meanings such as “giỏi lắm” for good behavior, “tốt lắm” for general favorable conditions or approval, “đúng rồi” for correct or agreeable, or various other meanings. The word “sit” or literally “ngồi xuống” should be more in conversational rather than commanding tone. It would be “con ngồi xuống đi” for the former which means “please sit down, child”, or “con ngồi xuống ngay!” which would mean “sit down immediately, child”. The word “stop” in general means “ngừng” meaning stopping an action or a motion, but really should be “ngừng nói” for stop talking, “ngừng lại” for general stopping (walking, running, talking, whatever he/she is doing), etc. The word “eat” is simpler with the meaning “ăn”, but is never used by itself. It would be better to say “con ăn đi” for “please eat, child” or “con ăn ngay bây giờ” for “eat immediately!” or various other ways to say it. The point is in Vietnamese, speech patterns is highly dependent on class or levels between individuals, and the environment in which the conversation occurs. So if you can help clarify some of these situations then I will have the audios recorded. Pronunciation for a condiment used on Vietnamese food – nuc mom(?). Also Vietnamese for dog, cat, monkey and monkey face. Hi Marty: Please see my response for you in Pronunciation of Pho and Other Vietnamese Words and Phrases, Part 2. Alex: The recordings indicated that the parents are complaining about your friend skipping class/lost a class (maybe not getting a class that he needs/wants) while they work hard to provide for his needs. According to the recording your friend seems to be just goofing off during the week during school, as a third person on the recording indicated that he could goof off during the weekend, but why goof off during the week too. Anyway the language is crude as mentioned by others in the comments of the YouTube page; a lot of d…m… which are equivalent to English m…f… I hope your friend shapes up. Now was there a question about pho somewhere? Noodles”? I reallyseriously appreciated the blog post! Ina: I’m very happy you found these posts helpful. I started the blog LovingPho.com to share with non-Viet people the facts about Vietnamese pho noodle, what it is and isn’t, how to properly enjoy it and how to make it should one likes a challenge. I had planned to get deep into much details about pho, from ingredients to spices, to how the noodle is made, to etiquette at the table. Along the way, I realized that, in order to understand and enjoy pho, a non-Viet person also needs to immerse himself or herself into the language, the pronunciation, the history, and the taste and smell of pho and its environment. As a result, I opened up a number of posts to take in readers’ suggestions and questions about pronunciation. This post ““Pronunciation of Pho and Other Vietnamese Words and Phrases” is one of my favorite posts, and it got so popular with so many requests on all kinds of topics, that I had to start a Part 2 in order to allow quicker loading of these huge posts. Woah this blog is magnificent i really like reading your articles. Keep up the good work! You already know, a lot of people are hunting round for this info, you can aid them greatly. Woah, many thanks for your kind words and encouragement. Hopefully many more readers will find this blog useful and enjoyable to read. @Jane: Sorry about the slow loading. Actually the site should be fine, except for pages where I have tons of audio files which require sometime to load them all. Compounding to this is the high number of comments/suggestions/requests left by our visitors. We’re looking for ways to speed things up for these pages. Thanks for dropping by and leave your feedback. How would you say “Two orders of ______” or “Three orders of _____”? @Tyler: There are 2 things going on in your questions. 2) In Vietnamese, we are very specific in placing an order for something. There is no catch-all term like “order” to call for your food. For example, if I order a cake for later pickup, we would use the term “đặt bánh,” meaning “placing a cake” or “placing an order for a cake.” If I order a bowl of pho for eating in, informally (which is in most situation) we would use “cho tôi một (1) tô phở” or just “cho một (1) tô phở,” meaning “give me a bowl of pho” or just “give a bowl of pho,” respectively. The latter phrase is not a sign of disrespect or being snobbish to the wait person. Rather it’s really a silent tôi (me) being used to speed up things and everyone would understand this. As you can see it is not simple to give you a generic “orders of” something. If you can clarify then I can give you the correct pronunciation for what you have in mind. Otherwise, I’ll provide recording for ordering of pho. I’ll have this up in a few days. Thanks for an excellent question. By the way, it is considered snobbish if one says “I want this” or “I would like that” in a Vietnamese restaurant. This may be acceptable at an American restaurant, and is only acceptable in Vietnamese culture if a child is involved. Thanks Cuong! I had no idea that ordering food could be so nuanced. I look forward to hearing the proper pronunciation and learning the numbers! I adore bun rieu. 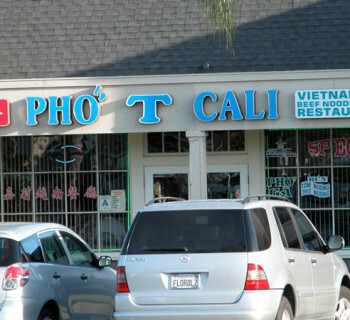 But every time I try to pronounce it my Vietnamese friends wince. Can you help? and check out #17. Bún riêu (with crab) is one of my favs as well. It’s a little tricky to pronounce properly. The next time your Vietnamese friends make fun of your pronunciation, you show ’em. My son is from South Vietnam. How do I pronounce part of his name which is Tu with an accent over the u.
Hi Cuong, I know you said to leave new pronunciation requests on Part 2, but for the life of me, I do not see a comment section/form. So I’m forced to leave it here. My aunt is Vietnamese. Everybody pronounces her name “Van” like the vehicle. When we first met her, there was some confusion as to whether is was “Van” or “Vin” (like bin). She told everyone that it was fine to just call her “Van” (like the vehicle). This makes me sad. I hate it when people feel like they have to compromise the pronunciation of their names because most Americans can’t be bothered to get it right. I much prefer to accurately pronounce their names like they would pronounce their own names. I feel like settling for an inaccurate pronunciation is disrespectful of that person and their culture (and just plain ignorant). All that to say, how DO I pronounce her name? Did I give you enough information to know to which name I am referring? That’s all I know, in any case. Additionally, my new favorite dish is Banh It Tran, or mung bean dumplings (savory). I don’t know the accents or diacritics because the websites I have seen the recipe on, don’t display the characters properly. Hi Jennifer Hughes: Sorry about the comments in Part 2. I had it turned off temporarily. I totally respect your point about your aunt’s name, and many other Viet names that had to transform into something easier for English speakers to pronounce and/or remember. In some cases it is very much a necessity in my opinion (such as in corporate, public speaking or broadcasting situations, like TV and radios), because you want to help listeners/followers to remember your name quickly and easily. But in many other cases, it only take little effort.